Summary: “Then he was alone.” With that opening sentence, Holly Hobbie begins her tale of an abandon little gray and white kitten. He wanders through the city, until he is picked up by animal control. While being in the shelter is different, he is cared for and fed. Here, “boredom was better than misery.” One day a family adopts him and takes him home. They name him Swan, and he learns what is means to be adopted and to adopt the family as his own. 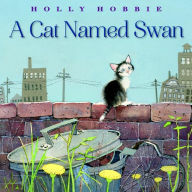 Literary elements at work in the story: Hobbie’s text focuses on reflecting the sensory and emotional responses of Swan. Her pencil and watercolor illustrations provide a visual take on the cat’s transition from the dinginess of the city alley to the full-color countryside. Together, the text and the illustrations provide the contrast between pre-adoption and post-adoption. How does the perspective on gender/race/culture/economics/ability make a difference to the story? All of the humans featured in this story are white. There is no diversity. Compared the rich, bright, and colorful countryside, the illustrations of the urban city scenes are gray and cold. Theological Conversation Partners: The story of Swan’s adoption may bring to mind the adoption of Moses. Placed in a basket and sent down the Nile River, the Pharaoh’s daughter adopted the infant as her own, without which the child would have been killed. The adoption of Moses was a saving grace, not just for the baby, but for the people Israel. Galatians 4 uses the language of adoption to describe what happens to those who are redeemed. Charles Cousar writes that Christ “changes orphans into legally adopted children.” (Galatians, p. 93). Just as Swan realizes that “he belonged to them [the family] and they belonged to him,” when adopted, the redeemed belong to God. How would you describe Swan’s feelings at the beginning of the book? After he was adopted? What difference did Swan’s adoption make? Use paper plates to make Swan’s face. On one side ask the children to draw Swan’s face before he was adopted, and on the other side draw the cat’s face after he was adopted. Talk about the differences. Recall the story of baby Moses being adopted by the Pharaoh’s daughter. How are Swan and Moses similar? In what ways did Swan bring happiness to the family? If you have pets, how do they make you feel happy? Consider inviting the local animal shelter to visit and talk about adoption of animals. Consider ways to help the local animal shelter: Make dog biscuits; collect gently used toys and blankets. Thanks to Union Presbyterian Seminary alumnus Jason Stanley for writing our book review this week. A Cat Named Swan by Storypath is licensed under a Creative Commons Attribution-NonCommercial 4.0 International License.